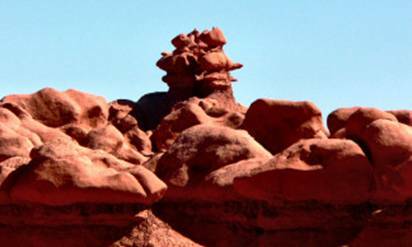 This page only covers Goblin Valley state park, which is extremely remote even by Utah standards. 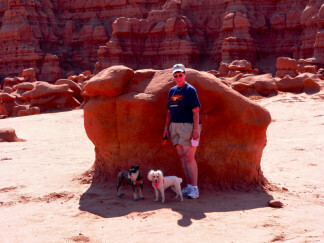 It is too far away from our base near Bryce Canyon for a day trip, so it is on a separate page from the state parks in the Southwest part of the state. Dead Horse Point is also outstanding and covered on another page. Wild Horse Mesa on the edge of Goblin Valley State Park. 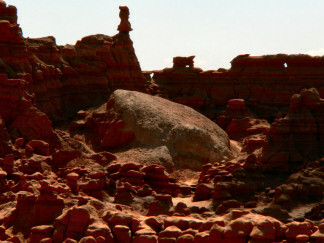 Goblin Valley State Park was formed by wave action when this area was a sea shore. The appearance is other worldly. 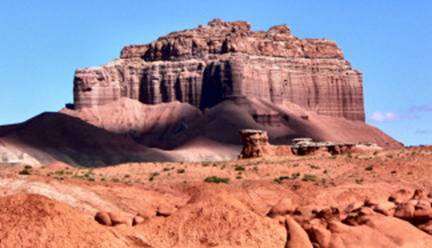 In fact, more people have probably seen it as another planet than have seen this wonderful place in person. 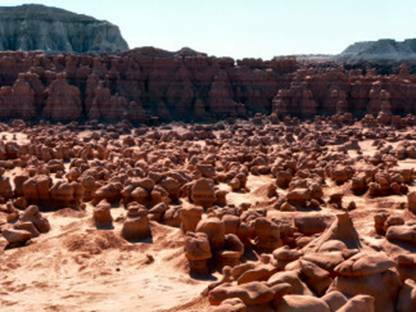 The movie “Galaxy Quest” used Goblin Valley as the “planet” where the crew had to land to get a new Beryllium Sphere. 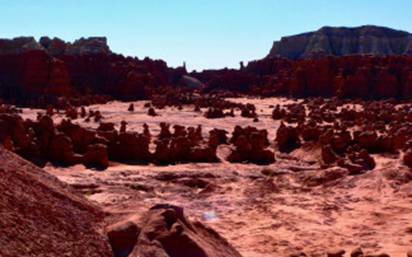 Even the trailer has a few brief glimpses of Goblin Valley. The Goblin Herd marches on. Frog Rock is at the lower left. 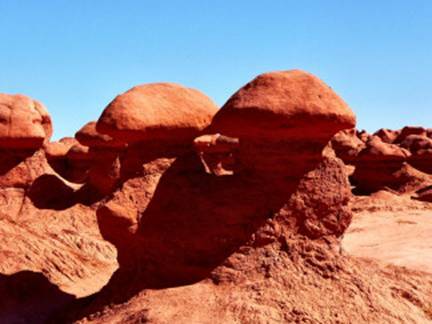 We have seen many other worldly places in the West, but none is stranger than Goblin Valley. 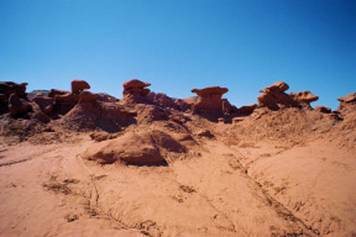 Goblin Valley is one of the more remote places that still has paved roads. Only Big Bend National Park is more remote with paved roads. 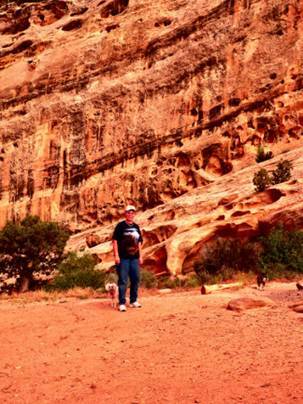 The Torroweap section of the Grand Canyon has no paved roads and is even more remote. 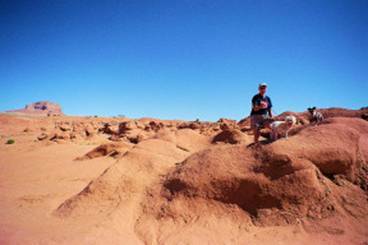 There was no campsite available in Goblin Valley State Park. 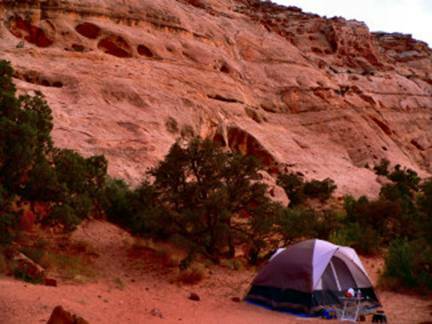 We camped on nearby BLM (Bureau of Land Management) land. We had purchased a tent so we could travel light. The night’s sleep was so restful (when a desert mouse came into the tent to get to the dog’s water dish) that we never used the tent again. The area was fascinating. You could see results of millennia of wave action. Look behind Phyllis in the picture below right. 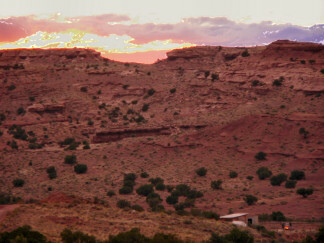 The Desert sunset (below left) was outstanding.